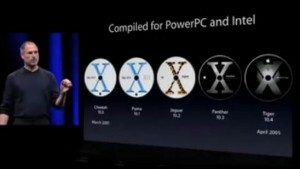 In a keynote address at Apple’s Worldwide Developers Conference, Steve Jobs announces that Macintosh computers will transition from PowerPC to Intel processors and demonstrates Mac OS X running on a computer with an Intel Pentium 4 processor. Jobs revealed at the time that Apple had been secretly preparing for a possible transition to Intel for many years. Unbeknownst to the public, for every version of Mac OS X released, Apple actually had prepared a version running on an Intel processor. By making the transition to Intel, Apple paved the way for the resurgence of the Macintosh computer by making it more compatible with software for Microsoft Windows.